In the past, I’ve always had a handful of ladies over for wine tasting, but this time, I decided to just have my two besties. Not only does that make finding a date that works much easier, but that will give us a good chance to catch up. We’ve all been friends since middle school, and though we’ve definitely gone our separate ways in many aspects of our lives, I am still very close to each of them at heart! I thought a small intimate tasting would give us a chance to catch up with few distractions. This tasting was a little different from others that I’ve hosted. In reading my very favorite magazine, Food and Wine, there was an article titled “Wine-Tasting Workout: Train Yourself to be a Better Wine Taster”. While my general rule of thumb for tasting wine is ‘if it tastes good to me, then it’s good’, I’m always open to refining my palate and expanding my tasting vocabulary. This particular article focused on six key things that wine pros are evaluating when judging a bottle of wine: body, tannins, acidity, sweetness, aromas and flavors, and oak. Because each exercise called for at least three different wines (that would be over 18 bottles), I narrowed it down to three exercises (tannins, body, oak) and two wines from each, making a more manageable 6 bottles for the three of us. All six workouts would be an excellent tasting activity for a large group. And don’t worry about any “wine snobs” in your group. I guarantee that they’ll be able to learn something from these exercises! Food and Wine tends to suggest wines that I cannot find in my local wine shops, so instead of getting the exact label, I focused on the region and grape to get something pretty similar to what they recommend. I listed F&W’s suggestions as well as the wines that we tasted. In the end, I think we all learned more about wine tasting and how to better describe flavors. We’ll have to follow-up on the other three categories that we didn’t get to try this time. This night may or may not have ended in a dance party (including a guitar from Rock Band), so I’m thinking the 6 bottles we had was plenty (and no, we didn’t finish them all – just the reds 😉 ). Of course we couldn’t have a wine tasting without some snacks! During the tasting, we snacked on zucchini fries, sweet potato fries with chipotle in adobo dipping sauce, and an antipasto platter. 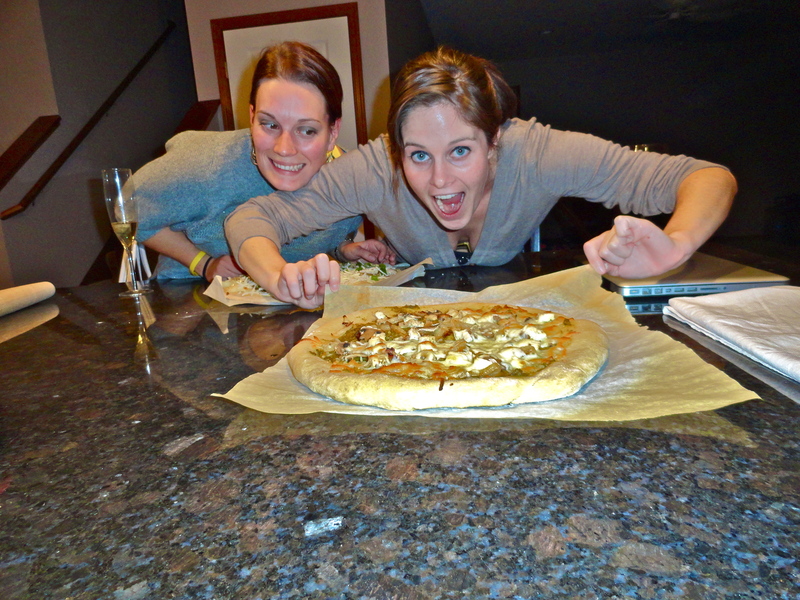 After the tasting, we headed into the kitchen to make some pizzas (pesto chicken with caramelized onions, grilled zucchini and roasted garlic hummus, and pepperoni with veggies and mariana). For dessert, we indulged in a delicious peanut butter pie. What defines body in wine? In my opinion, body is one of the more simple qualities in wine to pick out. “Body is the sense of weight or richness or heaviness, and even the feeling of viscosity that a wine leaves in your mouth,” says Master Sommelier Andrea Robinson. Typically, a wine with more body has more alcohol and comes from warmer climates. This is because the grapes have more sugar to be converted into alcohol. How does body affect pairing? When pairing wines and food, it’s essential to match body with body, so the wine is not too heavy or too light for the dish. Directions: Taste each milk in ascending order of richness, beginning with skim and ending with the cream. Consider the texture in your mouth; the skim milk will dissipate quickly, while the cream will coat your tongue. Next, taste wines from lightest to full-bodied. Our findings: I have to admit that we all felt pretty silly sipping different kinds of milk out of shot glasses, but when we switched the wine, we really could tell the difference in body. The Chardonnay was closest to the whole milk, not quite a cream, and the Pinot was similar to the skim. Crazy! What are tannins? Tannins are compounds in grape skin, seeds and stems that contribute to the structure, complexity, texture, and ageability. Tannins can create a drying, slightly bitter sensation in the mouth. How do tannins affect pairings? A more tannic wine will pair nicely with rich foods and meat dishes. Tannins cut through fat, and in turn, the fat softens tannins and make them more approachable. Directions: Pour 8 ounces of hot water into each of the mugs. Place one tea bag in each mug and start a timer. After 2 minutes, remove the tea bag from first mug. After 4 minutes, remove the tea bag from the second mug. After 8 minutes, remove the tea bag from third mug. Let tea cool. Taste the tea in increasing steep-time order, swishing the liquid around in your mouth before swallowing. Notice how the teas become more astringent as the steeping time increases. Next, taste wines in increasing tannin order. Our findings: I’ve always felt that tannins were difficult to judge, and mostly because no one could really describe to me what they tasted like. The steep time in the teas really defined what a non-tannic and tannic wine tastes like. The Beaujolais was so smooth and left almost no residual dry taste in your mouth, where the Bordeaux was heavily tannic and comparable to the tea steeped for 8 minutes. What does it mean for a wine to be oaked? When oak barrels are used in winemaking, they develop their toasty, caramelly, vanilla flavors from being fire-charred. The barrels can be toasted to different levels, depending on the winemakers preference, and can be used to hold the wine during fermentation and/or aging. Older oak seems to have a more subtle affect on a wine’s tannins, structure, and overall flavor. How does oak affect pairings? In general, oaky wines don’t pair well with most food because it can overwhelm the food’s flavors. However, bold-flavored grilled dishes can be a nice match as the char from the grill mellows the wine’s oakiness and highlights the vibrant, juicy fruit flavors. Directions: Skewer a marshmallow and roast it over a flame on a gas stove until it’s charred. Oakiness in reds leave the impression of campfire smoke or the smell of a burnt marshmallow. Next, taste wines in order of unoaked to oaky. Our findings: Oak is another aroma/flavor that wasn’t very clear to me. After charring our mallows, smelling, then smelling the wine, the “campfire” smell really came through in the Cabernet. The Chianti had very little oakiness, so you could still smell it a tiny bit. 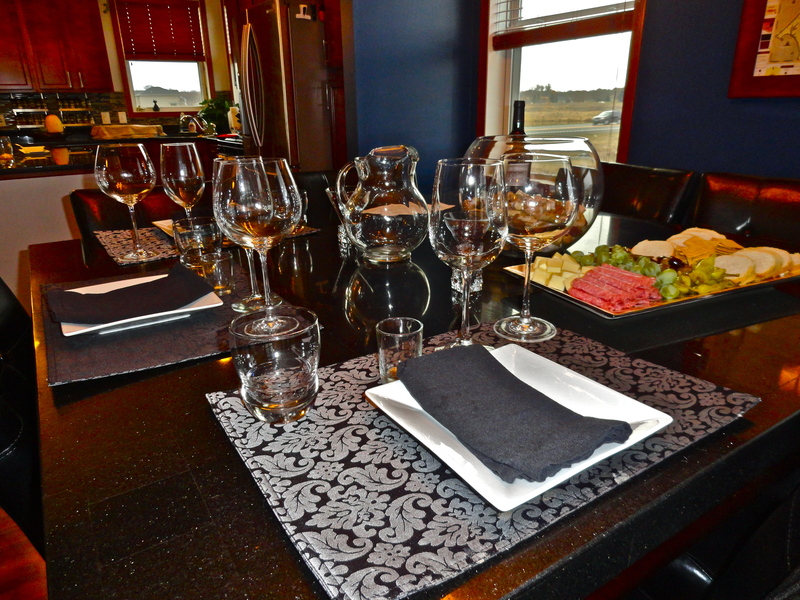 As you might have noticed, I just posted a ton of recipes from my ladies wine exchange. 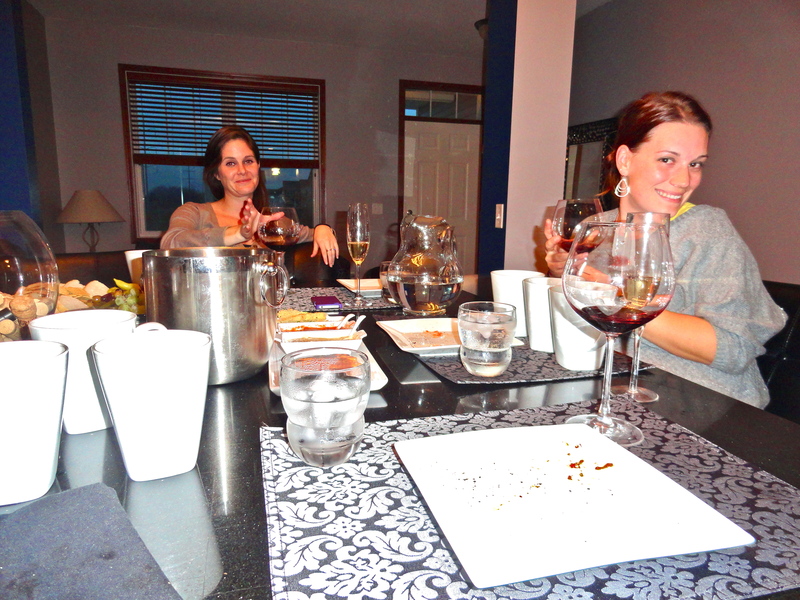 It was a wonderful evening of wine and women, and of course some great snacks! 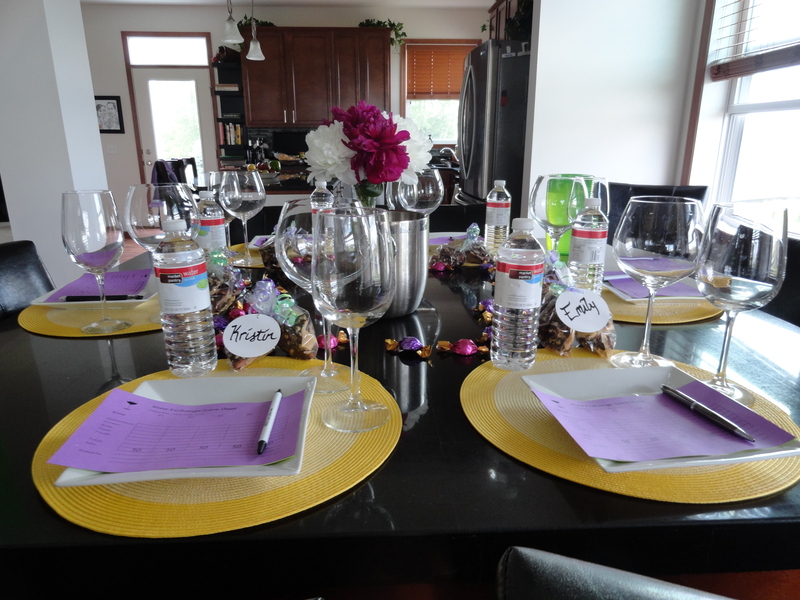 Here’s a sneak peek at my table setting. The flowers were a nice surprise from Nate’s mom’s garden. Gorgeous, and they matched my spring color theme quite well. Thanks, Marsha!! 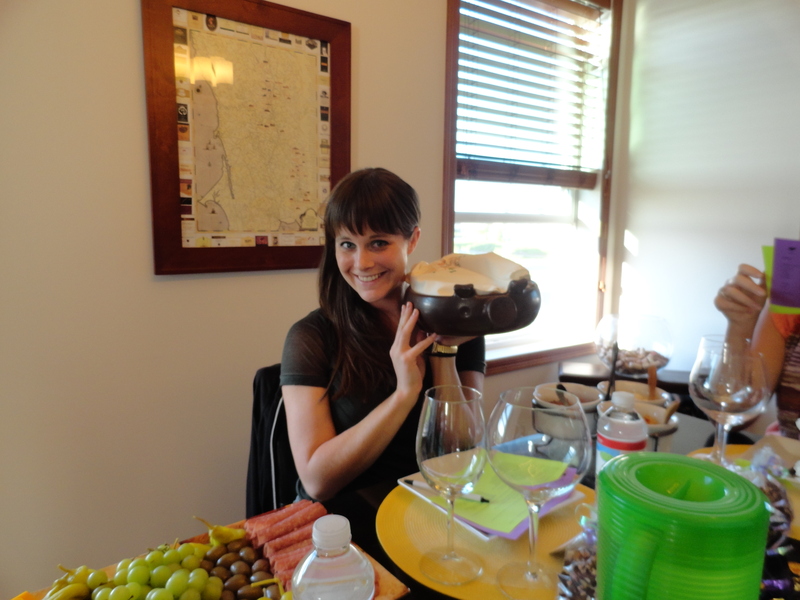 Here’s a cute picture of Leah with my new piggy serving dish from Nate’s mother as well. So cute! I had a wonderful time with some exceptional women. 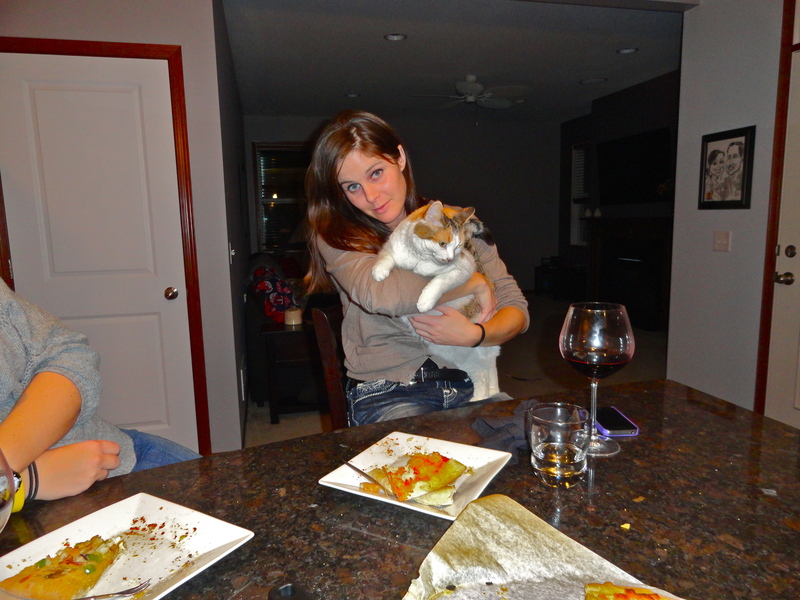 I’m hoping to have this type of party more often, but we all get so busy, it’s hard to plan for. I’m thankful for each of these ladies in my life, in different ways, and thankful they were able to indulge a bit with me for this event.